ROCHESTER, N.Y. – A shorthanded James Monroe Red Jackets team was determined to get a victory Tuesday night. 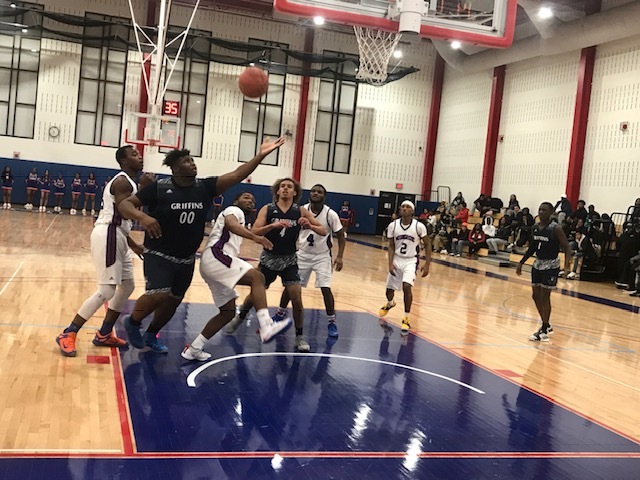 Head coach Matthew McCormick’s squad got the job done, defeating the World of Inquiry Griffins. De’vante Mateo led four players in double-figures with 19 of his 29 points in the first half as the Red Jackets held a 36-31 lead. 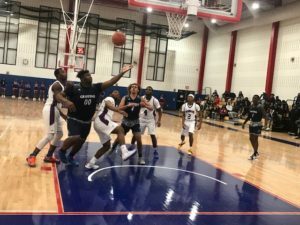 The senior guard finished six layups-two resulting in three-point plays, swished five free throws, three mid-range jumpshots, and two three-pointers. Coming out of the locker room after halftime, the Red Jackets surged out to a double-digit lead with a 10-3 run for a 46-34 advantage with 3:51 remaining in the third quarter. Seniors Tyquil Glasgow and Jo-Nathan Jones combined to score eight of the 10 points on two layups and a pair of free throws each. Jamar Williams had a layup of his own. During the run, the Red Jackets (8-4) held the Griffins (2-9) to eight missed field goals, while forcing three turnovers and allowing just one field goal in 14 possessions. Mateo sparked the Red Jackets with a three-point play and a pair of free throws during a 12-2 run midway through the fourth quarter for a 69-52 edge with 5:19 remaining. Senior guard Kerone Kearse made back-to-back layups and Jones knocked down a long-range shot from the right corner. During the run, the Red Jackets forced the Griffins into three turnovers, two missed field goals, and one made field goal in seven possessions. The Red Jackets got out to a fast start in the first half. Mateo swished a pair of three-pointers while Glasgow knocked down one as well during a 9-4 run for a 34-19 lead with three minutes remaining in the second quarter. Mateo scored seven of the Red Jackets’ first 15 points of the game on two mid-range jumpers and a three-point play as they busted out to a 15-2 lead. Williams made a layup and a long-range shot while Glasglow had a layup of his own to go along with a free throw. During the run, the Red Jackets held the Griffins to nine missed field goals, five turnovers, and one made field goal in 16 possessions. Glasgow finished with 19 points on 6-of-8 shooting from the charity stripe, four layups, a mid-range jumper, and a three-pointer. Willams netted 11 on three layups, went 2-of-2 from the foul line, and hit a shot from beyond the arc. Kearse finished with five points in the quarter and 10 for the game. The senior guard converted three layups, hit a shot from beyond the arc, and a free throw. “We played great team defense. We struggled a little at the beginning but we got it together,” Kearse said after the victory. Jones (9) and Cameron Thomas (2) rounded out the scoring for the Red Jackets. Tremier Dollar poured in a game-high 39 points for the Griffins. The senior guard netted 11 layups, one which resulted in a three-point play, six free throws, three shots from beyond the arc, and a mid-range jumpshot. Dollar scored five in the first period, 14 in the second, four in the third, and 15 in the fourth. The senior guard’s 15 points in the fourth quarter came in the final six minutes. Dollar also scored 14 of the Griffins’ 22 points in the second quarter. The senior guard grabbed five rebounds, dished out five assists, and had two steals. Dollar netted six points on two layups and a mid-range jumpshot during a 12-2 run to end the first half. Junior guard Michael Thomas converted two layups and sophomore guard Dorian Smith had one of his own. During the run, the Griffins held the Red Jackets to 10 missed field goals and two turnovers in 14 possessions. Dollar hit a three-pointer, a layup, and a free throw during a 10-3 run that spanned from the end of the first quarter into the middle of the second to cut the deficit to 18-12. Thomas and Smith each made a layup as well. Senior forward Bobby Searight grabbed a team-high seven rebounds. Thomas blocked a team-high two shots. Monroe was missing seniors Fidel Brock and Trevone Glasgow. Brock, a starter, has missed all or part of the past five games. Thomas (8), Smith (6), Jahlil Bell (6), JaQuan Close (4), Josh Shaw (3), and Searight (2) rounded out the scoring for the Griffins. Monroe will host Livonia tomorrow night at 6:15 PM.